Did a supremely intelligent being create the universe? can make even an atheist curious. When Lord Maha-Visnu, a plenary expansion of Lord Krsna, exhales, innumerable universes emanate from Him. Within each of these universes Maha-Visnu expands Himself as Garbhodakasayi Visnu and lies down on the water that fills half of each universal shell. We can hardly imagine the greatness of Maha-Visnu since according to Srimad-Bhagavatam the smallest of the universes is four billion miles in diameter. But although the design evident in every corner of the visible world strongly indicates the plan of an intelligent creator (God), by logic alone we cannot be absolutely certain that He exists. The origin of the cosmos is beyond our experience. We did not observe the creation of the universe, and for all we know it could have happened in any number of ways that we have not considered or are unable to consider. On the platform of logic, therefore, the debate over whether or not there is a Supreme Being, a Creator, must always end in stalemate. The Vedic literature confirms that we cannot conclusively understand the Supreme Being by logic alone. The Bhagavad-gita declares that the Supreme Personality of Godhead, Krsna, who is the creator of both this universe and the spiritual world beyond it, can be understood only by His mercy, when He is pleased to reveal Himself to His faithful devotees. Although our logic and mental gymnastics cannot rise to embrace the Lord, He can by His omnipotence pierce through the uncertainty and ignorance of His faithful servants and show Himself to them. While confirming the fallibility of human reasoning, however, the Vedas do not recommend that we abandon reason. If we lack a deep philosophical understanding of God, our faith in Him tends toward sentiment and fanaticism and easily falls prey to atheistic arguments. The Vedic literature therefore includes all manner of logical arguments—including the argument from design—indicating that the universe is the work of a supremely powerful person. But the Vedic literature goes further as well, describing in detail the stages of creation, the age and dimensions of the universe, the purpose of the creation, and the origin of the material elements. The Vedic literature, in other words, not only proclaims “God created” but also tells us how and why He created. To begin with, the Vedic literature asserts that the Supreme Lord is not obliged to participate directly in the creative work. While theists sometimes conceive of God as an extremely hardworking old man, who has little time off from His duties as creator, the Vedic literature explains that God creates by His desire alone, without having to exert Himself in the least. Since He possesses unlimited power and wealth, He can, like any wealthy person, get others to do the work for Him. If a wealthy financier wants to construct an office building, he doesn’t do everything himself. He conceives a general plan or chooses a building site, then hires lawyers, architects, engineers, contractors, and so on to execute His will. The financier doesn’t have to dig the foundation, pour the cement, or lay the bricks. Like the wealthy financier, the Supreme Lord is aloof from the work of creation, but just how He delegates the creative duties, and to whom, is unique. 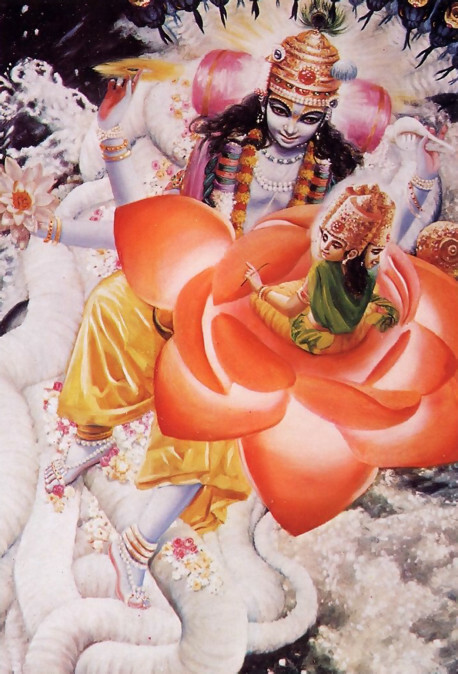 Unlike ordinary persons, Krsna can expand Himself into innumerable forms, known as plenary expansions, who are equal to Him in power and opulence. These expansions are all the same Personality of Godhead, Krsna Himself, and yet at the same time They are individuals with independent thoughts and actions. Brahma-samhita gives the analogy that just as one candle can light many other candles, each with the same power to illuminate, so Krsna, the original Personality of Godhead, can expand Himself into innumerable plenary forms and still maintain His identity as the supreme, original person. 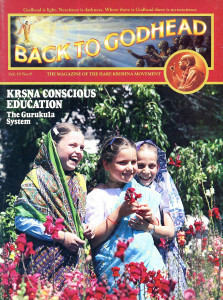 A person’s appearance on millions of television screens at once partially illustrates Krsna’s power to expand, the difference being that the television expansions are only images of the original person and must move and speak as that person does, whereas Krsna’s expansions, although non-different from Him, can act as They please. They are not mere images, but complete individuals. While the wealthy financier must employ others to fulfill his desires, Krsna creates the universe through these individual expansions of His own self. Further elucidating this transcendental phenomenon, the Svetasvatara Upanisad explains that to achieve our goals, we rely on three attributes, knowledge (jnana), strength (bala), and activity (kriya). To construct a large building, for example, the architects and engineers need sufficient knowledge of the building sciences, the construction company must have sufficient strength in the form of manpower and machines, and everyone has to engage in various activities. The Supreme Lord, however, possesses within Himself all knowledge, all strength, and all potential to act and can therefore accomplish anything He wants. By investing these powers in His various expansions. Krsna effortlessly executes the business of creation. The financier works through his money, while Krsna works through His personal expansions and energies. Within each universe, while lying on a bed of celestial snakes floating on the universal waters. Garbhodaksayi Visnu creates Brahma, whom He empowers to create all planets and all species of life. Brahma, who in this universe has four heads, is born from a lotus sprouting from the navel of Garbhodaksayi Visnu. Krsna’s ability to expand Himself is inconceivable—beyond the range of ordinary logic. But it is inconceivable only in that we human beings cannot do it and have not seen anyone else do it. Otherwise, accepting that God is all-powerful, nothing He does is inconceivable. Rather, His apparently inconceivable attributes serve as testimony to His omnipotence. Therefore the Vedic literature, by describing Krsna’s attributes in detail, does not preclude a logical approach to understanding the Supreme Lord, but rather draws our use of logic onto a higher, transcendental platform. Krsna’s first expansion for the creation is Maha-Visnu, who begins by manifesting the material elements from His transcendental body. Modern scientists will object to the mention of a creator. The material energy is eternal, they say, so why bring in God? But the Vedic literatures respond that Maha-Visnu is also eternal and that the material elements are His eternal energy. God and His energy are like the sun and the sunshine, which exist simultaneously, although one is the origin of the other. Both God and the material energy are eternal, and yet God is the source of the material energy. We might also wonder how Maha-Visnu could perform the gigantic act of creating all the material elements without becoming totally depleted, dispersing Himself into the elemental creation. Materially speaking, when we take something from a particular source, we gradually exhaust that source. Withdraw money from your bank account, and the balance goes down. Pour water from a glass, and the glass empties. Take milk from a cow, and the cow gradually dries up—unless she can replenish her supply from a pasture or feed bin. Since God is by definition the source of everything, there is nothing outside of Him to replenish Him. So what happens to Maha-Visnu when He creates the material elements from Himself? The Isopanisad says that nothing happens to Him at all. Maha-Visnu is unaffected and unchanged, even while supplying an unlimited quantity of elements. How could this be? Because depletion and exhaustion are properties of matter. Maha-Visnu, however, is not matter, but pure spirit, and therefore He has no material properties. He produces the complete cosmic manifestation from His own form, yet remains perfect and complete. As Krsna expands into Maha-Visnu without changing His form or identity, so Maha-Visnu creates the material elements, yet remains complete in Himself. The Srimad-Bhagavatam informs us that from the material elements Maha-Visnu produces not one, but innumerable universes, or, rather, universal shells. These gigantic shells are hollow spheres. The lower half is filled with water, and the upper half is—at least initially—empty. The Bhagavatam also states that our particular universe is the smallest of all the universes, and yet the space inside the shell measures four billion miles in diameter, while the shell itself is billions of miles thick. Although Lord Brahma is an eternal, individual person, he is not a plenary expansion of the Lord. He, like you and me, is a jiva-tattva expansion, in quality equal with Krsna but quantitatively minute. The jiva-tattva expansions are part and parcel of Krsna, and as such their eternal, blissful function is to render loving service to Him. In fact, they have no other function, just as a finger has no other function than to render service to the entire body. When the jiva souls are separated from the eternal service of Lord Krsna, they lose their eternal blissful nature, just as a finger loses its very life when severed from the body. Before coming to the material creation, the jiva souls live in the eternal spiritual world, which lies beyond the material universes. There they act in their relationships as servants, friends, and associates of the Supreme Personality of Godhead, Krsna. Since these relationships with Krsna are based solely on love, however, the jiva souls have a minute degree of independence: they can choose to remain subordinate to the all-powerful Supreme Person, or they can desire to neglect His service and become independent lords themselves. Without this choice, this freedom to serve or not to serve, there is no question of loving God, since love is necessarily an act of free will. A minority of jiva souls, misusing their independence, desire to enjoy life without Krsna. It is to fulfill—as well as to reform—this unnatural desire of a relatively small number of jivas that Lord Krsna creates the material world. Walled within the shells of material universes, the independently-minded jivas are awarded bodies in any of the millions of species and are allowed to forget their eternal life of bliss and knowledge with Krsna. According to Bhagavad-gita, a jiva soul is situated in each living body just as a driver is situated in an automobile. The driver is different from his car, although he directs its movements. Similarly, the jiva soul, although doggedly trying to enjoy a body made of the material elements, is separate from it. Each kind of body—from the microbe to the human being—affords the jiva a particular kind of sense enjoyment, a different means for trying to satisfy his godless longings. Within each of the innumerable universes, Garbhodakasayi Visnu expands as Ksirodakasayi Visnu, who then expands Himself unlimitedly to enter the hearts of all the living entities in His particular universe. This expansion of Krsna is known as Paramatma, the Supersoul, who accompanies each jiva soul in his search for material pleasure. In the Gita, Lord Krsna says that, as the Supersoul. He directs the jivas’ search by supplying them with memory, knowledge, and forgetfulness. Al death, the jiva soul is taken from his present body and prepared for his next birth in one of the 8,400,000 species. All this is arranged by the Lord in the heart. The human body is just suitable for austerity, self-realization, and rewakening Krsna consciousness, but if a human being acts and desires like an animal, he is allowed, in his next life, to enjoy in the body of an animal. In marked contrast to the jiva soul, the Supersoul, although situated within the material body, is never controlled by a desire to enjoy matter. Krsna and His expansions are the controllers of the material energy, whereas the jiva, as long as he desires to forget Krsna, is controlled by the same energy. In the Upanisads the jiva soul and the Supersoul are compared to two birds sitting in the same tree of the body. One Bird (the jiva) tries to enjoy the fruits on the tree—material pleasures—forgetting the other bird (the Supersoul), who is patiently watching. The Supersoul observes and directs the jiva’s activities, unaffected by material desire. Only the jiva souls assume material bodies and try to enjoy matter. We all have experienced, however, that this material world is not a place of unadulterated enjoyment. In fact, it is sometimes argued that even if there is a God. He could not he good or just. since His creation is filled with disease, old age, death, and many other miseries. Krsna, however, creates the material world not just for our independent sense enjoyment, but also to remind us that enjoyment outside of His service is illusory. When a man goes mad, forgetting his friends, relatives, and his own self, whatever enjoyment he experiences in that maddened state is worthless. In the same way, the jiva souls have forgotten their eternal relationship with their dearmost friend, Krsna. Until they reestablish that relationship, they will be able to realize but a small fraction of their potential for happiness, even if they acquire wealth, fame, beauty, education, and other temporary material advantages. The material desires are designed to remind the jiva that the material creation is foreign to him, and thus they evince God’s concern for our true welfare. The jiva who comes to his senses and practices Krsna consciousness can very quickly return to the spiritual world. Lord Brahma, the first jiva soul in each universe, is in charge of constructing all the planets and planetary systems. He is also in charge of creating the 8,400,000 species of life, including aquatics, insects, plants, birds, animals, and human beings. Inspired and empowered by Garbhodakasayi Visnu, Brahma assembles the creation using the material elements. Starting from just above the waters of the ocean that fills halt the universe and extending up to his own planet in the topmost reaches of the dome of universal space, Brahma constructs fourteen planetary systems, one above the other. The earth planet is in the seventh of those fourteen planetary systems. Brahma doesn’t create his own materials—the elements—and even in manipulating them he is dependent on Lord Visnu for guidance and inspiration. Nor does Brahma create the life which animates each body, for life is not the result of a combination of the material elements. Brahma only assists in creating the bodily vehicles, while the life, the eternal jiva souls, is supplied by the Supreme Lord. Of the many differences between this short description of Brahma’s creation and currently popular scientific descriptions, two are especially important. The first is that the Vedic literature portrays the original creature in each universe as highly intelligent, more so than even the greatest modern scientist. Brahma’s intelligence, and his resultant creative accomplishments, are surpassed only by Lord Visnu Himself. Modern scientists, on the other hand, assert that the original creature in the universe was a microbe, and that the forefathers of modern man were apes and cave-dwellers. The second contrast is that the Vedic literature asserts that all species were produced more or less simultaneously at the beginning of the creation, while popular evolutionary theory holds that the species have gradually evolved. According to the evolutionists, aquatics evolved into land animals and land animals evolved—only a relatively short time ago—into human beings. Evolutionists acknowledge, however, that one of the many flaws in their theories is that there is still—more than a century after Darwin’s debut—no fossil record showing one species evolving from another. For dedicated Darwinists this lack of evidence is only an impetus to revamp their theories. But for the dedicated devotee of Krsna it is a confirmation of the Vedic version that all species of life, including the civilized human beings, have existed since the dawn of creation. In this connection it is also interesting to note the Vedic calculations of the age of the universe. The Vedic literature states that Lord Brahma lives for one breath of Maha-Visnu. 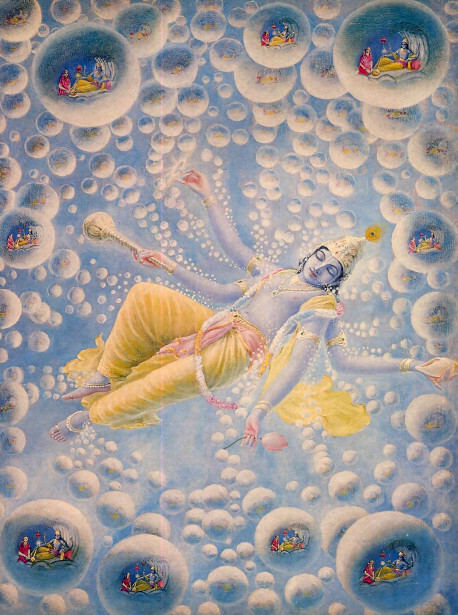 When Maha-Visnu exhales, the material elements and universes emanate from Him, and when He inhales, the universes are destroyed and merge back into His body. Thus the universes and their respective Brahmas are created and destroyed with every breath of Maha-Visnu. The entire cycle—one breath of Maha-Visnu, or one lifetime of Brahma—takes 310 trillion solar years. According to Srimad-Bhagavatam, Brahma’s life is half over at present, which means that this universe has existed, along with all the species, for 155 trillion years. There are many other contrasts between the Vedic version of creation and other versions—both theistic and atheistic. The Bhagavatam and other Vedic texts analyze the relation of time to the universe and to the Supreme Lord, the role and development of each material element, the origin of gravity, and many other details of the creation. At each step the Vedas reveal a unique understanding of the creative process. Many people will argue that few if any of the Vedic descriptions can be scientifically proven. But neither can they be “scientifically” disproven. How can you prove or disprove the gigantic form of Maha-Visnu? And why should we not at least consider the Vedic literature as evidence? It is the oldest, most voluminous, and most consistent body of literature known to man, and it contains information not only of the creative process, but of every science human society needs, including medicine, economics, and so on. By its comprehensive nature alone, the Vedic literature deserves serious study by researchers in every field. Devotees of Krsna accept Vedic statements as evidence—as axiomatic truths—not due merely to the length and detail of the Vedic texts, but because the author of the Vedas is Krsna. In the Bhagavad-gita Krsna says, “By all the Vedas, I am to be known. Indeed, I am the compiler of Vedanta, and I am the knower of the Vedas.” For the devotees, at least, statements made by the Absolute Truth are perfect evidence, irrefutable proof. No credible scientist even maintains that stupid idea whatsoever, because there is no such thing. Evolution occurs over vast amount of times, and it does not involve something turning into something else with a magical “transition”. But please do explain vestigial *leg bones* in whales. PS: Funny how you’re knocking science but where did you get your 8.4 million figure from? *Scientists. * How are you publishing this website? *Science* helped you. Who do you turn to when you are sick? A scientist who is a doctor. PPS: Go ahead and tell your kid to answer on a test that the solar system formed because of Lord Brahma and not accretion (due to gravity and physics) and see if it doesn’t get marked wrong.